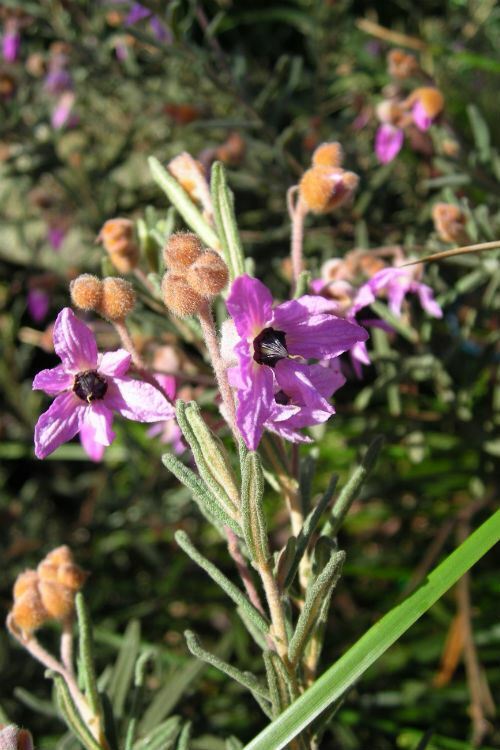 I have been growing Lysiosepalum involucratum for many years, in my garden in the northern Sydney suburb of Westleigh. 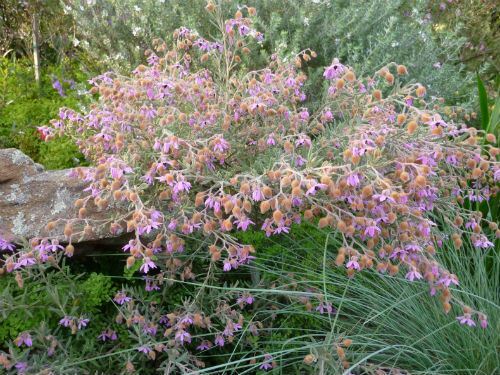 It is a small rounded shrub that grows to about 60 cms high and one metre wide and produces masses of pink to mauve cup shaped flowers, from late winter to spring. The petals are very small and the sepals provide the colourful parts of the flowers. The rough, narrow leaves are 10 - 25 mm long and grey-green in colour. My plants are growing in a thin layer of topsoil over a clay sub soil and receive little additional watering as they will tolerate extended dry conditions once established. They grow naturally in South Western Australia on sandy and gravelly soils and are quite hardy when grown in temperate areas of the eastern states, provided they have reasonable drainage and a full sun or partly shaded position. The only maintenance I undertake is to lightly prune after flowering to keep them compact and promote better flowering next season. Lysiosepalum involucratum is an under-rated plant and one that should be grown in every garden. However, you need to go to a specialist native plant nursery to buy them as they are rarely available in general nurseries. Lysiosepalum; From Greek lysios, loosening and Latin sepalum, a sepal, referring to the separation of the sepals. involucratum; from Latin involucrum, a wrapper or covering and the suffix atus, possessive of, possibly referring to the bracteoles surrounding the flowers.